Maynard Dixon, the native of Fresno, California who painted with subdued tones a unique form of mural-impressionism (and I would be remiss if I did not mention that my dear old friend is a cousin of the Dixon clan, including Maynard); and Frederick Remington, a bold original whose painted works could look a bit rough-and-ready. 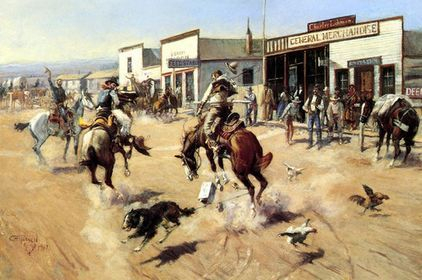 The one Artist of the Old American West, of the Frontier West, who wins, hands-down, in my painter’s palette of favorites for setting the West in motion is Charles Marion Russell. 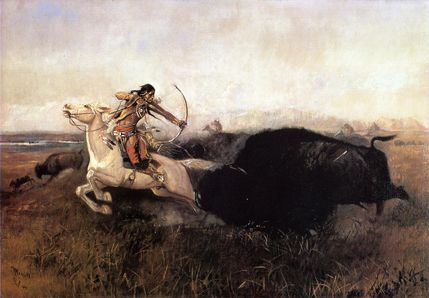 This painter, like Remington, also created bronze sculptures, and, also like Remington, his pictures told tales. With Russell, however, the pictures were detailed action stories, infused with emotion and intricate mystery. It is not coincidental that Russell was also a storyteller and an author. His paintings were the physical forms of his ability to craft an evocative narrative line across a canvas. C.M. Russell was born in Missouri on 19 March 1864, near the end of the U.S. Civil War. From an early age, he felt passionate about the Wild West. He read about the region and learned tales of the frontier; and he intently observed the fur traders and the explorers, the “mountain men,” as they traversed the state of Missouri, this gateway to the West. Those courageous men were bound for the untamed frontier of the United States. It wasn’t long before Russell himself longed to be heading their way. At the age of sixteen, he left formal schooling to venture westward from his home in Missouri. This young man had already had mastered horseback-riding; now he would work on a sheep ranch. 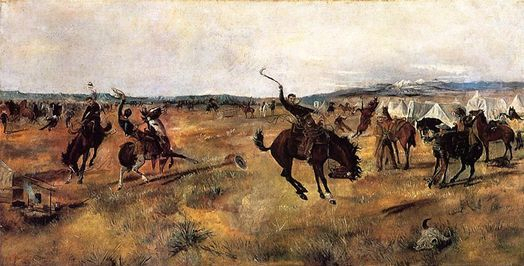 It was this pragmatic working-man side of Russell that set him apart from many other painters of the American frontier. He wasn’t a studio artist, nor was he a man who sought artistic acclaim. Charles Russell loved the land that would become his primary subject matter in oil and in watercolors and in gouache, a type of watercolor. The job on the sheep ranch didn’t pan out, but another job did, with a rancher who had started out, like many men who came West, as a hunter and a trapper. “Kid” Russell was taught the ways of the West, the life that he determined would become his own. 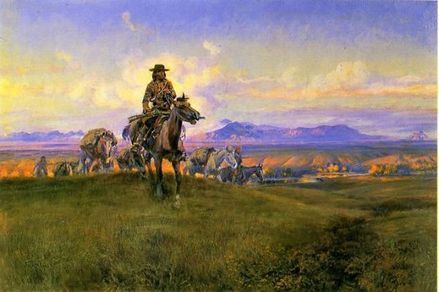 In 1882. he returned to his family of origin in Missouri, but then returned to Montana, to the wide open spaces that would be his home for the rest of his life. He became a cowboy. His life was rugged and bleak, often life-threatening, on the Montana frontier. The winter of 1886-87, in particular, froze many of the cattle where they stood. 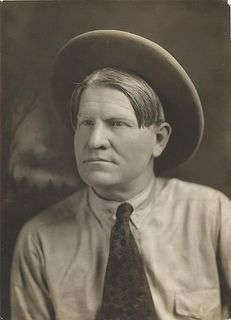 Russell “documented” the historic conditions at the O-H Ranch in the Judith Basin of central Montana. The ranch-owner inquired of the ranch foreman how that herd of cattle had fared during the icy winter. The foreman sent his boss a post-card in the form of a watercolor painted by Russell. The scene of a starving steer, being eyed by hungry wolves, cast beneath a blue-gray winter sky: that picture was worth 1,000 words. The ranch-owner realized his cowboy was more artist than drover. He displayed the artwork in a shop in Helena. Russell was destined for painting for a living; he’d soon leave cattle-herding behind him. His works became increasingly detailed and more vibrant. He came to know the Indians of the region, the wild horses that set his canvases to life, the landscapes ablaze with color and form. Russell developed the sense of the American West at a time when that part of this nation needed accurate reporting. In a way, he was the journalist of the canvas, the chronicler of a culture that began to become marketable, very marketable as the 20th century beckoned to this young country still in search of its identity and destiny. 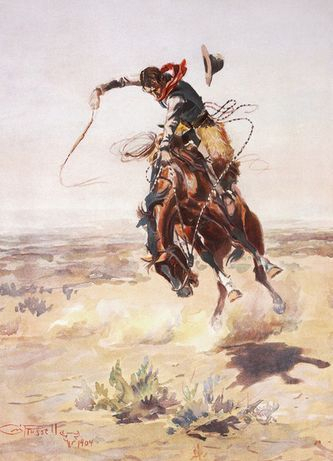 Always, his sense of the real, his commitment to accuracy, and his love of the West guided his hand in creating more than 2,000 paintings of Cowboys, Indians, and landscapes of California, Arizona, and Colorado. The West was set in motion by his vision of the land that he’d journeyed to become so much a part of. His works were labors of love with an intensity that other artists of the West did not fully convey. His palette was typically muted but it was also moving, as if the reality of action was just as important as the multi-shaded tones of his cherished subjects. His American West was not mythic; it was marvelous in spirit, detailed, dynamic: living history that tells stories to this very day. Charles Russell died on 24 October 1926. On the day of his funeral, the children of Great Falls, Montana were allowed to leave school to watch the somber procession through town. Four black horses pulled the coffin in a coach, as befitted the humble but august author and painter of the great American West.